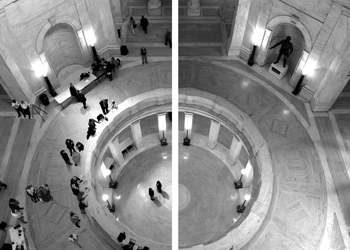 The crack of the gavel set off a resounding echo throughout the hallow halls of the Capitol, Saturday, April 9. These actions, which took place in the House and Senate, officially concluded the 2005 Legislative session. Throughout the 60 day Regular Session a total of 1,364 bills were introduced. Of these, the House passed 305 bills and the Senate passed 207 bills. Many times the House and the Senate will pass different versions of the same bill: however, a bill cannot complete legislative action unless both houses pass the same version of the bill. When the two bodies cannot reach a consensus, a conference committee is appointed. A conference committee is constructed of an equal number of Senators that are appointed by the Senate President and Delegates that are appointed by the Speaker of the House. In the end, 265 bills completed legislative action making their way through both the House and the Senate. Senate Bill 418 was a notable highlight of legislation that was passed by both houses during this session. This bill dealt with the elimination of Third Party Bad Faith Lawsuits. It also creates a compensation fund for mistreated consumers. Other accomplishments by the 77th Legislature were: Senate Bill 147 which will limit access to certain over-the-counter medicines that contain key ingredients which are used in the illegal production methamphetamine drugs; House Bill 2891 which will grant the Governor official oversight over several state agencies; and, Senate Bill 603 which will give West Virginia University and Marshall University greater control over their finances and purchasing powers, as well as granting them control over tuition and fee rates. House Bill 2782, which allows cities to expand membership on park and recreation boards, was passed with an amendment which would have made English the official language of West Virginia. This bill was returned to the Legislature during “Budget Week”, after it was vetoed by the Governor, and passed for a second time without the added amendment to meet the Governor’s objections. More extensive summaries of these and other measures passed this year can be found inside this edition. April 9 was the final day of the 2005 Regular Session; however, to comply with the Constitution of West Virginia, which requires the Legislature to pass a budget for the upcoming year, the Governor extended the session for one week. The House and the Senate passed their versions of the Budget Bill during the Regular Session. Within the extended week of the 2005 Regular Session, the two bodies appointed members to meet in a conference committee to iron out the differences in the separate versions of the budget. In the end, the Legislature passed House Bill 2005 as the official budget for the 2006 Fiscal Year. On Saturday April 16, the extended session adjourned sine die, and was followed immediately by the Second Extraordinary Session of 2005. During this short special session lawmakers passed six appropriation bills and adjourned again sine die, concluding the immediate work facing members of the 77th Legislature. Launching the legislative battle against increasing methamphetamine production and abuse in the state, lawmakers approved legislation that addresses this issue, which has become one of growing concern nationwide, especially in rural areas such as West Virginia. According to the 2002 National Survey on Drug Use and Health, an estimated 12 million Americans have tried methamphetamine. And the United States Drug Enforcement Agency reports that clandestine methamphetamine laboratory activity in West Virginia has grown threefold in the past several years. To curtail this escalating problem, Senate Bill 147 restricts access to ingredients used in this narcotic’s production. These products include any that contain ephedrine, pseudoephedrine or phenylopropanolamine as single active ingredients, except products that are intended for pediatric use. Only physicians, pharmacists, pharmacy technicians or healthcare professionals are authorized to sell, dispense or distribute these medications in pharmacies. This legislation also prohibits pharmacies and individuals from displaying a drug product with these active ingredients where the public has clear access. Instead, these products must be placed behind a pharmacy counter where only pharmacists, pharmacy technicians and employees have access. Strict inventory control standards are to be maintained. Additionally, any person who purchases or receives these substances will be required to produce photo identification with his or her date of birth. Any time one of these products is sold, transferred or distributed, the authorized individual making the transaction will be required to report the date of the transaction; the name, address and identification number of the person; and, the type of product sold, as well as its total gram weight, to the State Board of Pharmacy. In addition to the provisions pertaining to the sale of ingredients used in the production of this narcotic, the legislation also addresses circumstances in which innocent individuals are exposed to methamphetamine. Under the new law, any adult who causes or allows a minor to be present where the drug is being made will be guilty of a felony and if convicted, will serve one to five years in jail and/or be fined a maximum of $10,000. If a child sustains serious injury from exposure, then the guilty adult would face three to fifteen years in jail and/or a maximum fine of $25,000. Also, any person manufacturing this drug who causes dangerous exposure to first responders, including firefighters and police officers, that results in injury will be guilty of a felony and fined $500 to $5,000 and/or confined in jail for one to five years. The Legislature passed a measure during its 2005 Regular Session that is intended to generate greater revenue for recreation and tourism. As a result, it is believed that West Virginia will be more attractive to new businesses and industries and existing ones will be more inclined to stay. Senate Bill 237 will allow municipalities to increase the tax which consumers pay to rent a hotel or motel room for a night. Under previous law, a municipality could only impose a 3 percent tax for the use of a room. Beginning July 1, 2005, a municipality will be able to increase that tax to no more than 6 percent. If a county already has a tax imposed on a hotel or motel within the municipality’s limits after January 1, 2005, then the county will be able to continue collecting that tax without the municipality being able to impose one. However, the tax will be limited to 3 percent. If the county commission discontinues the tax, then the municipality will be able to impose a tax no more than 6 percent. The total amount of taxable money cannot include charges for meals, valet service, room service, telephone service or any other charges not associated with occupancy of the room. All taxes collected will have to be referred to the taxing authority. The tax revenue will be deposited into the municipality’s or county’s general revenue fund. At least 50 percent of the total revenue collected within a fiscal year must be spent to promote conventions and tourism. If a convention and visitor’s bureau is located within the municipality, then it would receive the additional funding. County commissions will determine the appropriation of funds if a convention and visitor’s bureau is located within a county or region but not within a municipality. If there are two bureaus, then the city council or the county commission will determine how to divide the money between each. If there is not a bureau, then any hotel within the municipality, county or region may apply for an appropriation of the revenue. The hotel could only receive 75 percent of the amount which it collected and it must be used for the promotion of tourism and travel, which includes advertising, salaries, travel, office expenses, publications and similar expenses. Also, the hotel would have to submit a proposed budget of how the funds would be spent. Remaining funds would be expended to the regional travel council that serves the area where the municipality is located. Citing a turbulent and troubled insurance climate in West Virginia, Legislative leadership stressed the importance of reforming current state laws pertaining to third-party bad faith lawsuits and joint and several liability, both of which are part of a larger movement to reform West Virginia’s tort system. Tort is a legal term for misconduct and is applied to people or companies who commit a "civil crime", an act that creates a wrongdoing or injury to another person. According to proponents of a measure passed by the Legislature during the 2005 Regular Legislative Session, when not regulated properly, tort may have a significant negative effect on the availability and accessibility of affordable insurance policies. With that in mind, lawmakers passed Senate Bill 418, which eliminates third-party bad faith lawsuits and expands the powers of the Office of Consumer Advocacy, which is contained under the Insurance Commission. Under previous law, third-party bad faith lawsuits permitted individuals to sue another person’s insurance company through the state court system if they believed the insurance company failed to provide an adequate settlement, violating the Unfair Trade Practices Act (UTPA), specifically the Unfair Claim Settlement Practices Act contained within the UTPA. In its place, the bill provides a process in which the Insurance Commission would become the exclusive forum for third-party claims. Those individuals who believe an insurance company acted in bad faith may file an administrative complaint with the Insurance Commission. The Commission is then required to investigate the complaint and hold an administrative hearing and, if deemed necessary, seek the appropriate measures against an insurance company. The proposal also would increase fines and penalties on those insurance companies that have been found to commit unfair acts and act in bad faith. A single occurrence of bad faith would accompany a fine of up to $10,000 and several violations would see a fine of up to $250,000. Judicial review of the Commissioner’s ruling on the penalty would be available and would be carried out in the Kanawha County Circuit Court. In addition to the financial sanctions, the Insurance Commission also would have the power to revoke or suspend the license of the insurance company. Lawmakers also included in this legislation a fund, the Unfair Claims Settlement Practice Victims Fund, to help recover costs lost by consumers to companies that were found to have a pattern of bad faith actions. In addition, the insurance examination assessment fee will increase from $1,050 to $5,500, with $4,200 deposited into the Fund. Non-economic damages awarded to a victim cannot exceed $10,000. By allowing the head of the Office of Consumer Advocacy to work on behalf of all insurance customers in West Virginia, rather than only researching health insurance issues the high costs associated with legal actions against the insurance industry can be diverted to reducing policy premiums. The insurance lobby has stated that with the passage of this legislation they pledge to reduce all auto insurance policy premiums statewide by an average of $100. Through its research, the Legislature found that county commissions, municipalities and county boards of education face numerous challenges regarding the management of their budgets and delivering services required by federal or state law. To address this concern, the Legislature passed Senate Bill 419 which will create the Local Government Flexibility Act of 2005. This act recognizes that local units of government are sometimes restricted by policies, rules and regulations that can hinder their development. These restrictions also can prevent them from carrying out their duties and responsibilities in a cost effective and timely manner. This act will create a pilot program that includes a waiver program that will allow certain county commissions, municipalities and county boards of education to apply to the Governor to receive an exemption of a specific policy, rule or regulation. If the pilot program proves to be successful, it may be taken into consideration for a statewide initiative. This bill will divide the state into seven regions for the purpose of taking part in the Flexibility Act. Six of the regions will consist of counties that share a border with other states. The seventh region will entail all of the interior counties that do not share a border with another state. The most populated county in each region will be designated as the pilot county. If they reject the program, then the pilot program will go to the next most populated county in the region, and so on. If the county chooses not to participate in the program, then any municipality within that county can choose to participate if they choose. These pilot counties can request a local waiver regarding a policy, rule or regulation that they believe is preventing them from carrying out their duties and responsibilities in an effective manner. Applications for waivers must be submitted to the Secretary of Commerce who will then conduct an investigation or inquiry to gather any additional information necessary to evaluate the application. The Secretary of Commerce will then submit their recommendations to the Governor for approval. Whenever the Governor believes a statutory change is needed, the Governor will bring the matter to the attention of the Speaker of the House of Delegates and the President of the Senate. The Legislature has passed House Bill 2816, creating the Healthy Lifestyles Office in the Department of Health & Human Resources. The responsibilities of this office will include coordinating all efforts in the State to deal with obesity, prevent duplication of services and considering the resources of local health departments and recommending ongoing relationships between certain entities including local health departments. It would create a coalition appointed by the Governor to provide oversight as well as create a clinical advisory committee to assure a unified approach using the latest research. The office also will establish a statewide voluntary private sector partnership and recognition program for private sector businesses. The office must coordinate higher education training programs for dietary and exercise physiology students with rural health care providers as well as coordinate any existing health promotion initiatives to assure clear, concise and consistent communication. Also, for an elementary school, middle school or junior high school, the bill prohibits the sale of soft drinks during the school day in areas that are accessible to students. For high schools permitting the sale of soft drinks through vending machines, those schools also must offer for sale 50 percent healthy beverages. Healthy beverages are defined in the bill as: water; 100 percent fruit and vegetable juice; low-fat milk; and, any juice beverages with a minimum of 20 percent real juice. Also, kindergarten to 5th graders are required to participate in at least 30 minutes of physical education, at least three days a week. School children in grades 6 through 8 are required to participate in one full period of physical education each school day of one semester of the school year. Finally, 9th graders through 12th graders are required to participate in one full course credit of physical education and the opportunity in high schools to enroll in an elective lifetime physical education course. Schools that do not have the number of certified physical education teachers or the required physical settings are permitted to develop alternate programs that will allow current staff and physical settings to be used to meet the physical education requirements. House Bill 2891, which saw a long journey through both the House and the Senate as amendments were continually added and removed, passed the Legislature during the final hours of the 2005 Regular Legislative Session. The bill, which was by request of the Governor, restructures the Executive Branch of state government. Under this legislation, the Governor will serve as the Chair of the Educational Broadcasting Authority (EBA). He is granted the power to hire and fire an Executive Director for the Authority and to set his or her salary. An amendment to the bill provides that the Governor cannot control programming and that the Governor’s control of the EBA expires after four years, as does the appointment he makes for the position of Executive Director. The bill also allows the Governor to serve as Chair of the West Virginia Parkways, Economic Development and Tourism Authority with the power to appoint an Executive Director and set his or her salary. The reorganization bill also reduces the term of the Chief Administrative Law Judge of the Office of Tax Appeals from six years to four years. If the Chief Judge requests additional support, the Governor may appoint up to two additional administrative law judges for the office. The bill creates an Office of Technology within the Department of Administration to be headed by the Chief Technology Officer. The position was formerly overseen by the Governor’s Office. The reorganization bill also transfers the Bureau of Employment Programs to the Department of Commerce.